Optimized adhesive quantity, reliable quality checks and even greater customer satisfaction – Muller Martini’s new AMS Adhesive Monitoring System continuously measures glue application during perfect binding, optimizes the applied quantity and reduces costs thanks to lower glue consumption and less production waste. Muller Martini newly developed Adhesive Monitoring System (AMS) gives customers key benefits in terms of product quality and cost control. 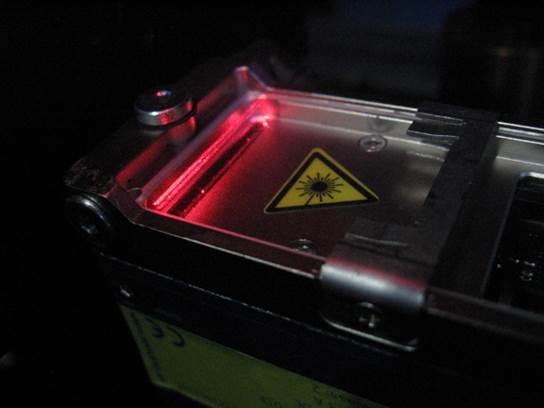 With AMS, a laser consistently monitors glue application during the production of softcover books. 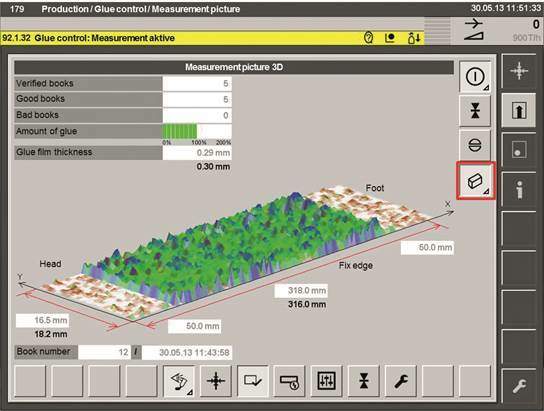 Glue application is measured reliably even for differing glue patterns thanks to the seamless integration of the adhesive monitoring system with the control system of the latest generation perfect binders. The data from the AMS is transferred to the operator monitor and the glue profile is clearly displayed on a color-differentiated graphic. This allows optimizing the applied quantity by fine-tuning directly on the monitor, thereby minimizing glue consumption and cutting costs, while maintaining the quality of the end products. The AMS not only measures and adjusts the glue quantity, but also reliably detects any gluing errors such as accumulations, gaps or dirt in the adhesive-free zone, allowing the operator to react to errors individually or automate their handling. That guarantees the higher quality of delivered books, thereby reducing complaints and leading to greater customer satisfaction overall. The new AMS can be used in Muller Martini’s Bolero and Corona perfect binding lines, as well as most Alegro assemblies. It can also be retrofitted on existing perfect binding lines depending on the machine configuration. By making a relatively small investment, graphic arts businesses will enjoy cost and quality benefits. Updates and upgrades to existing equipment under MMServices, the global service portfolio from Muller Martini, can increase a company’s ability to compete and enter new markets. The AMS monitoring system can be used for gluing using a glue pot or for VPN nozzles depending on the configuration – with either PUR or hotmelt gluing. The light sensor of the Adhesive Monitoring System (AMS) measures the applied glue quantity and also checks reliably for possible application errors such as accumulations, gaps or dirt in the adhesive-free zone. The glue thickness is displayed on screen using a clear graphic and the glue quantity can be fine-tuned manually.